This thoroughly updated 8th edition comprehensively covers the management of emergency conditions, as well as hundreds of diagnostic and treatment challenges in small animals. The user-friendly format provides instant access to vital information, making it an ideal resource in emergency situations. Includes a section dedicated to the clinical evaluation of patients using both organized body systems and problems list approaches. It also offers guidance on clinical signs and symptoms, laboratory tests, diagnosis, and treatment. Offers a wealth of proven, successful methods for recognizing and treating emergency problems, as well as core information for everyday practice. Provides essential information for the rapid assessment of patients and treatment planning. Coverage includes practical advice and solutions; how to examine the small animal patient, using a body systems and problems list approach; and a review of basic diagnostic procedures used in daily practice. Offers helpful recommendations for accurate and complete medical records management to help ensure quality care and legal compliance. Clinician Assessment: The "Problem List"
(!) Denotes a clinical sign that poses potential for a life-threatening condition. IMMEDIATE ASSESSMENT and INTERVENTION is indicated. 'I was excited to see a new editon. the eith edition is slightly larger than its predecessors, and therefore less pocket 'pocket sized' but retains it's original format...this si a versatile and useful book that ges far beyond its title. 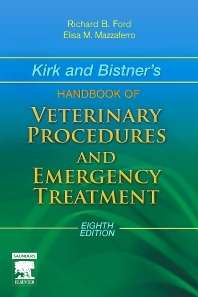 Outstanding sections include the approach to the poisened patient and section 5 (diagnostic testing)...a useful starting point for any vetinary surgeon who deals with emergency patients, and acts as a hand book for all.' Sophie Adamantos, The vetinary Record.